Traveling 15.9 miles overall, Florida 414 bypasses central Apopka and U.S. 441 (Orange Blossom Trail) along the John Land Apopka Expressway. The toll road ends at Orange Blossom Trail (OBT) and Maitland Boulevard near Lockhart. Maitland Boulevard extends the state road east from OBT as a controlled access arterial / expressway to the city of Maitland, Interstate 4 and U.S. 17 & 92 (Orlando Avenue). Upgrades to the six-lane arterial portion included construction of a single point urban interchange (SPUI) with Florida 434 (Forest City Road) by 2001, and the building of a new southbound off-ramp to U.S. 17 & 92 at the eastern terminus. Sound walls were also erected along the arterial west of Interstate 4. Florida 414 (Maitland Boulevard) at Florida 434 (Forest City Road). Photo taken 07/09/16. Work began in Winter 2007 on the first phase of the John Land Apopka Expressway. The six-mile extension of SR 414 west from OBT to SR 429 (Daniel Webster Western Beltway) was named after Apopka&apos;s mayor of 50 years, John Land. The eastern section, from Ocoee Apopka Road (CR 437A) to U.S. 441 (OBT) opened to traffic on May 15, 2009. Phase two of the Apopka bypass extended the toll road west from a temporary at-grade end with Ocoee Apopka Road northwest to U.S. 441 (OBT) at Plymouth. This section was incorporated into a realignment of SR 429 (Daniel Webster Western Beltway), in preparation for its northern extension along Wekiva Parkway. The 3.07 mile overlap between SR 414 and 429 opened to traffic on January 19, 2013. Construction associated with the Ultimate I-4 project redesigns the exchange with SR 414 (Maitland Boulevard) to eliminate traffic lights in both directions. Work also adds connectivity to adjacent Lake Destiny Road to the west, removing signals from Maitland Boulevard there as well. The addition of collector roads on both sides of SR 414 coincides with new ramps to Keller Road and Maitland Summit Boulevard, with the Maitland Boulevard mainline elevated to eliminate at-grade intersections. Wymore Road passes below Florida 414 (Maitland Boulevard) as it parallels I-4 northward through Maitland. Sandspur Road links the frontage road with Maitland Boulevard east via RIRO ramps. Photo taken 01/30/08. Second photo taken 01/29/08. Hope Road loops east from Wymore Road to connect with Florida 414 (Maitland Boulevard) west. Photo taken 01/29/08. Second photo taken 03/21/08. Third photo taken 01/29/08. "SR 414 Marden Road Partial Interchange Is Now Open." Central Florida Expressway Authority (CFX), web site. 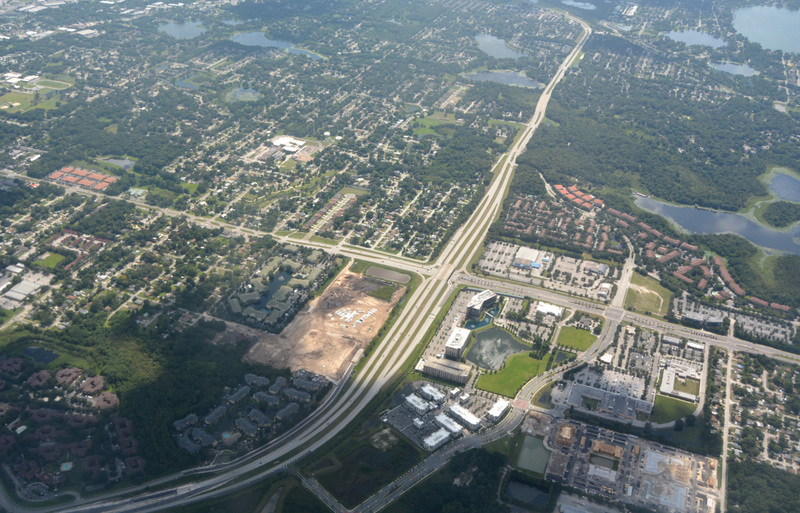 Marden Road Interchange - Central Florida Expressway Authority, Interchange Justification Report.